Construction of a new plant on wastewater treatment in Pirshagi settlement of Sabunchu district of Baku continues. 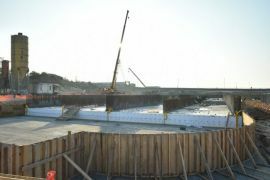 Water supply operator Azersu reports that construction is ongoing within the project of sewage treatment in Pirshagi with co-financing by the Azerbaijani government and the Eximbank of the Republic of Korea. The S Korean Eximbank contributed $43.5 million to finance the project on wastewater treatment in Pirshagi. The rest part of the $64.2 million worth project is financed by the Azerbaijani government.